Coming soon to a couch near you! We’ve been booking some intimate home shows in the Portland area this summer and are looking for some more homes to invade. So if you would like to host an Acoustic Living Room Concert please let us know! My 4th full-length CD is a combination of the best songs from my previous releases along with several brand new songs. Featuring “Green”, “52 Cards”, and “Nuthin’ Funny ‘Bout That”. Here are some quick links to various retailers where you can purchase a downloadable MP3 copy of this album. If you would like a physical CD with a lyric booklet, CD Baby is the best option & they ship Internationally as well. Here are some quick links to various retailers where you can purchase either a downloadable MP3 copy of this album or in some cases a physical CD with lyric booklet. 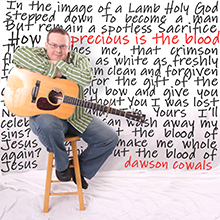 The music of Dawson Cowals has been described as “Dave Matthews sings Rich Mullins songs accompanied by James Taylor on the guitar.” (musicscene.com) It is this combination of driving acoustic rhythms, falsetto vocals, and poignant lyrics that have caught and held the ears of his many listeners. Where he laments his mistakes and the continual need for grace and redemption. This kind of self-examination is hard to find in today’s collection of cotton candy pop, which promises sweet fulfillment but leaves one empty with nothing but sticky fingers. Dawson’s refreshing approach of taking an honest look in the mirror gives one pause to reflect on one’s own motivations. He opens a brief window into the journey of his life and shares his sorrows and struggles as well as his hopes and joys. His introspective lyrics are woven through modern folk-rock licks with a blend of soft jazz, funk, and acoustic noodlin’ that challenges the ear and the tapping foot to keep up. And the mind isn’t forgotten on the side of the road to fend for itself. Borrowing often nearly word for word from scripture Dawson’s lyrics cover a wide range of topics from grace in the song “Skeletons in My Closet” to dealing with personal tragedy and the grief of losing a loved one in the poignant “When We Have Faces”. His songs focus on topics relevant to both Christians and non-Christians alike; ministering to the body of believers and holding out the truth and hope of the gospel to those who are searching. Newest single, "Precious Is the Blood", is based on 1 Peter 1:18 and features accordion and gorgeous harmonies! Our featured video is the new lyric video for Jehovah Jireh which speaks of how God is our faithful provider and knows our needs before we even speak. 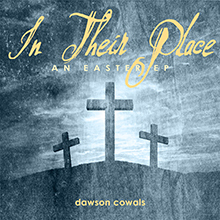 For a limited time you can download my Easter EP "In Their Place" featuring 3 songs from my 2008 "Coffee Shop Songs" CD & 3 songs from the new CD "White" coming out later in 2014. These songs share the power of the cross, Jesus' death and resurrection, and his salvation and amazing grace. I am so thankful that Jesus now intercedes with the Father on our behalf, "When You look at them, see me in their place!" Copyright © 2013 Dawson Cowals. All rights reserved.